• Measures fluorescence intensity at 530/590nm. 32 Compatible assays include acetate (acetic acid), cholesterol, glycerol, galactose and lactose. Requires mini glass tubes (see below). Lead time: 8 business days. 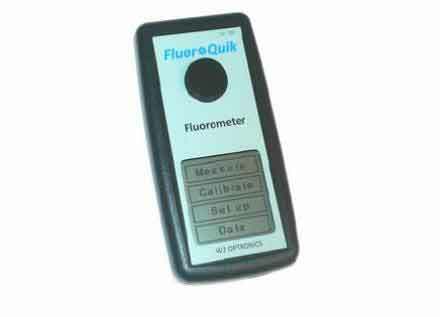 • Portable, light-weight and handheld fluorometer. • High sensitivity and rapid-reading. • Built-in memory saves data, which can be retrieved for data analysis by a USB interface. • A compact handheld reader that measures fluorescence intensity at 530/590nm. Product Type: Single tube fluorometer. Uses 100-200 µL mini glass tubes or PCR tubes. Very Simple Procedure: 1. Add assay reagent to Blank, Standard and Samples; 2. Calibrate reader with Blank and Standard; 3. Read samples. That is all! Validated applications 1: Cholesterol Assay (Cat# E2CH-100); 2: Lactose Assay (cat# ELAC-100); 3: Acetate Assay (Cat# EOAC-100); 4: Compatible with many more BioAssay Systems assay kits (fluorescence 530/590nm).